24V High Isolation Compact Transformers includes 10Volts, 12Volts, 16Volts, 20Volts, 24Volts, 28Volts, 36Volts, 48Volts, 56Volts and 120Volts. 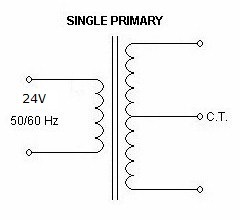 Single Primary of 24VAC with multiple outputs. Termination include Solder lugs, Quick Connects or lead wires. Operating Frequency 50-500Hz. Designed to meet UL/CSA. Best used for low-Voltage Isolation circuits. Customization to Standard products available upon request, High efficiency, Split Bobbin for High Isolation.